Welcome to Jodie’s Holiday Home Tour! 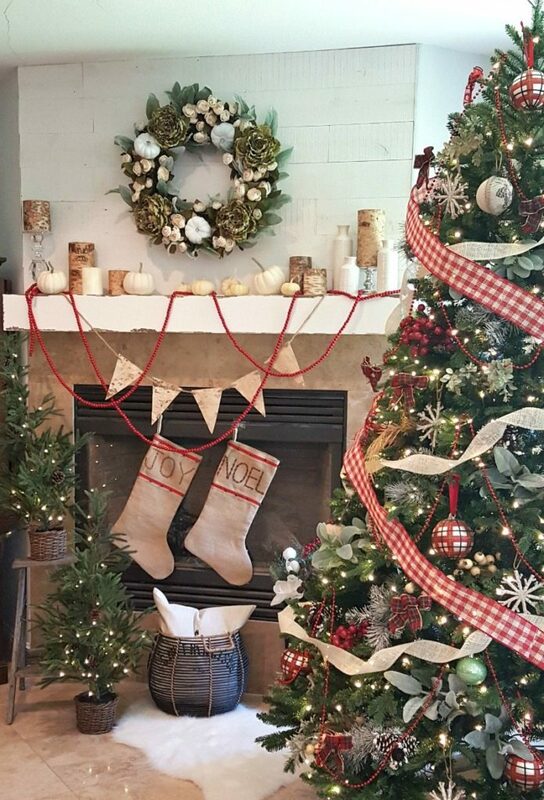 Birch candles from Pottery Barn, a birch wood banner and old fashioned wood beads are simple decor for the mantel. And my King of Christmas tree decked out with ribbons and plaid! The holidays are ON! Seasons Greetings! Welcome Friends, to my first Holiday Home Tour! Well, Julie and I are thrilled that you are here so let’s get decorating! 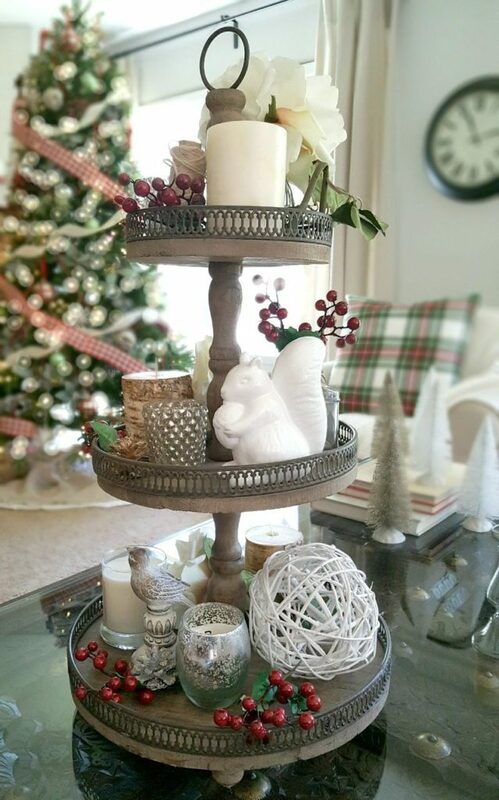 With so many gorgeous Christmas decor ideas out there it is very easy to get distracted and confused….and spend a lot of money. White Glam, Silver & Gold, Pink Modern, Silver Blue, Neutral Rustic, Old Fashion Vintage, …..ok, you get the idea. Each one of these decor themes is stunning! If you head out shopping without a clear vision of what you want to create you are likely to get lured into buying something from each of these because they are all so alluring. Defining your decor theme early on can stop you from buying items that won’t fit your theme and will save you a lot of money, trust me. I’m sure if you’re like most families, over time you have accumulated a MONSTER collection of Christmas decor. Once you pick your theme you have a very systematic and justified reason to sort through what you own and put HALF of it back in storage!! Seriously, you have my permission and you don’t have to feel guilty. Honestly, with just a bit of focus, inspiration and planning you will be able to create a more cohesive and more beautiful outcome! Confession: Ok, believe it or not, this is the first year I have decorated for Christmas with a “theme” in mind. In the past I haven’t given my decor very much thought besides just opening up the boxes and spreading out whatever I discovered inside. I knew I was going to need to put some more thought and planning into it this year! And I’m so glad I did for all of the reasons listed above. In the end I saved a lot of money, was able to keep things simple, and I LOVE the end result (and so does my family!) And I hope you will too! 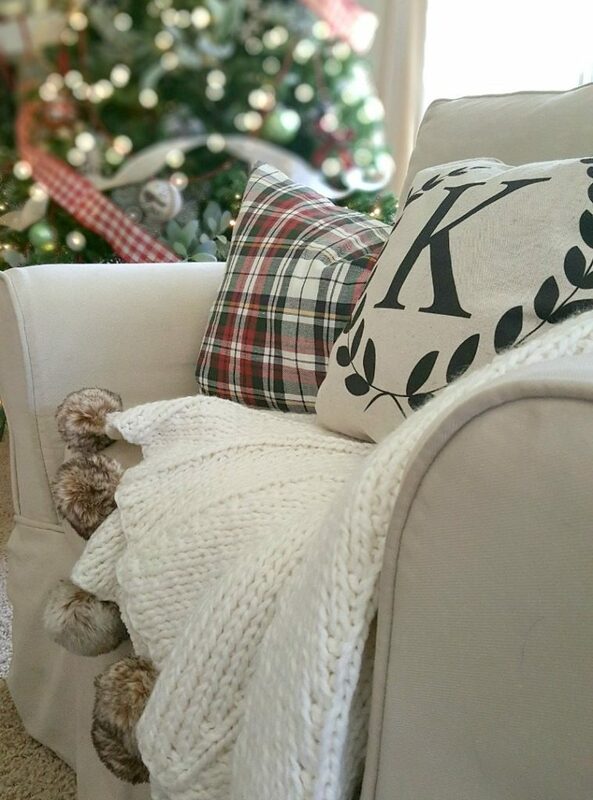 This plaid pillow from Pottery Barn was a perfect way to set the stage. 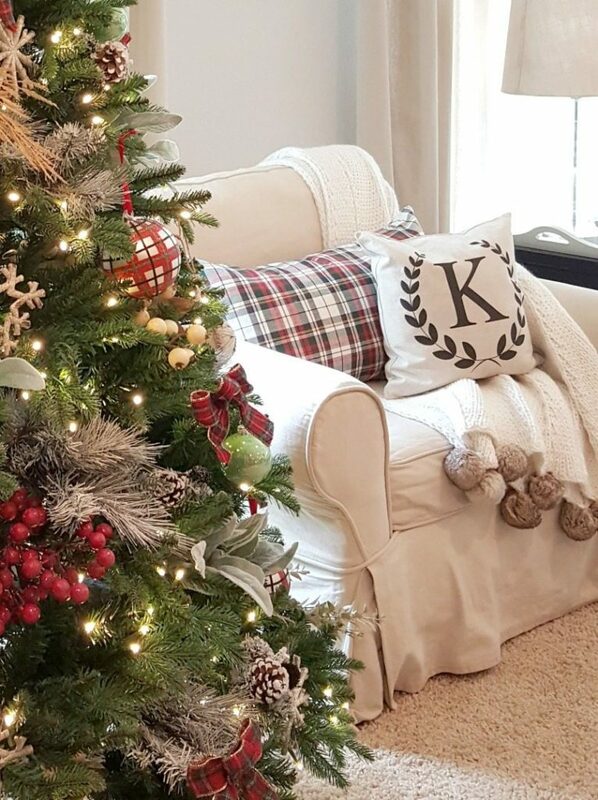 It was the perfect balance of red and white to stay with the natural & plaid colors I wanted. Everywhere I looked I was really drawn to everything plaid. I had been collecting plaid shirts and plaid blanket scarves for several years but I had never focused much on plaid in my decor until this fall. 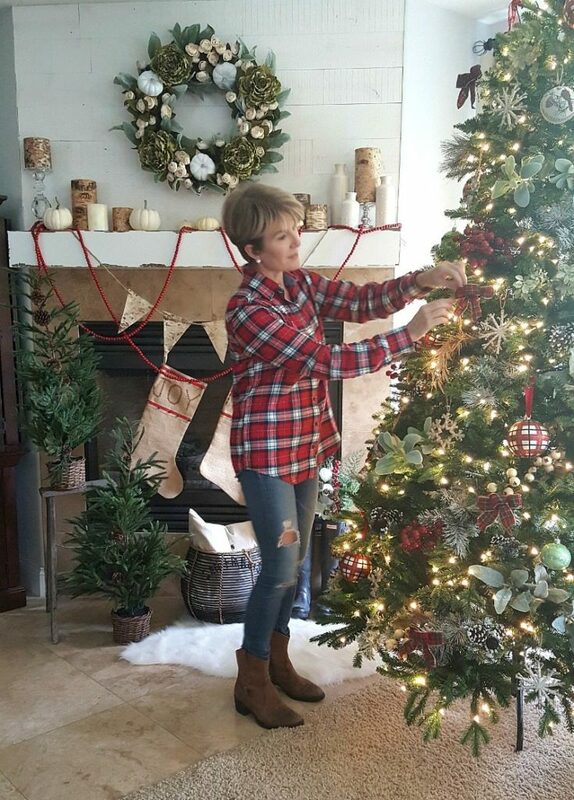 Additionally, I had never used plaid in my Christmas decor. This was good. “New” was good, and I knew I was headed in the right direction. Shop this pillow and throw from Pottery Barn. 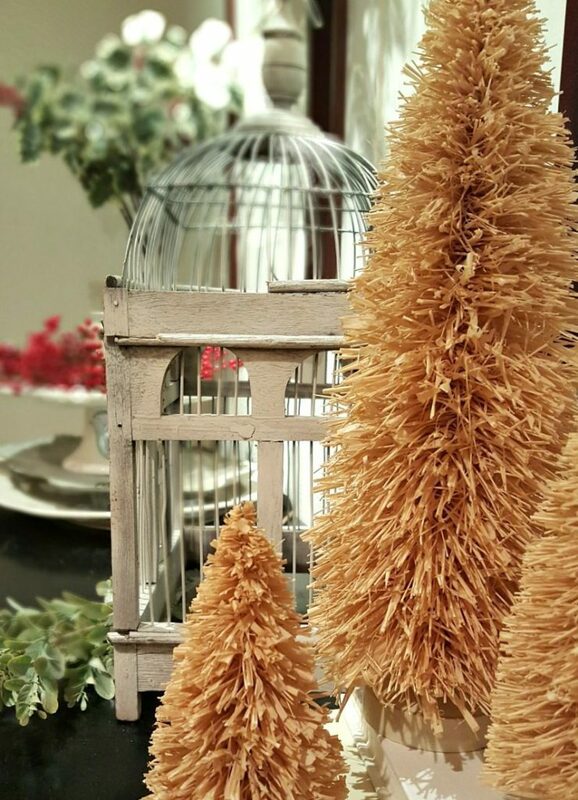 I found these natural bottle brush trees at an antique market. These were one of the first pieces of decor inspiration that helped me picture what I wanted my theme to look like. Rustic and neutral is not new for me. 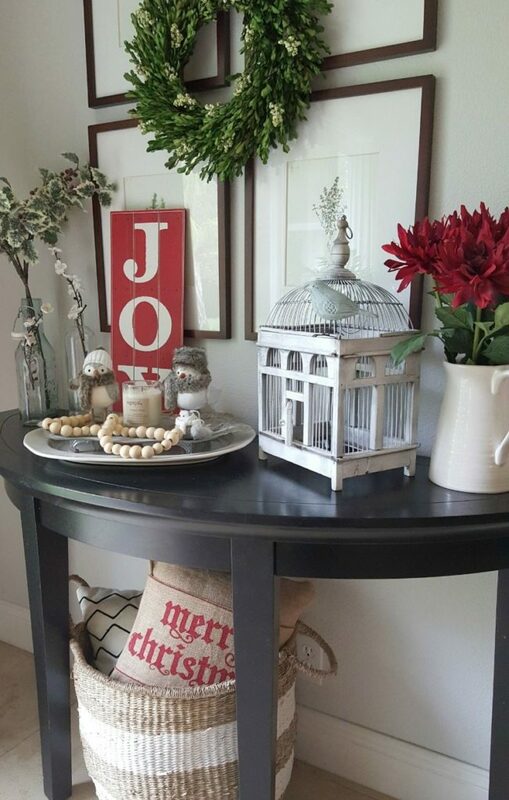 I love to decorate with neutrals year round and have a very casual style….so natural with a bit of rustic thrown in fit perfectly with what I love. Still, I had never applied this idea to my Christmas decor, so this would be a new take on Christmas. I didn’t know how I was going to interpret it for Christmas yet but it was a start. My neutral theme started to come together when I found these birch candles from Pottery barn and this handmade birch banner. 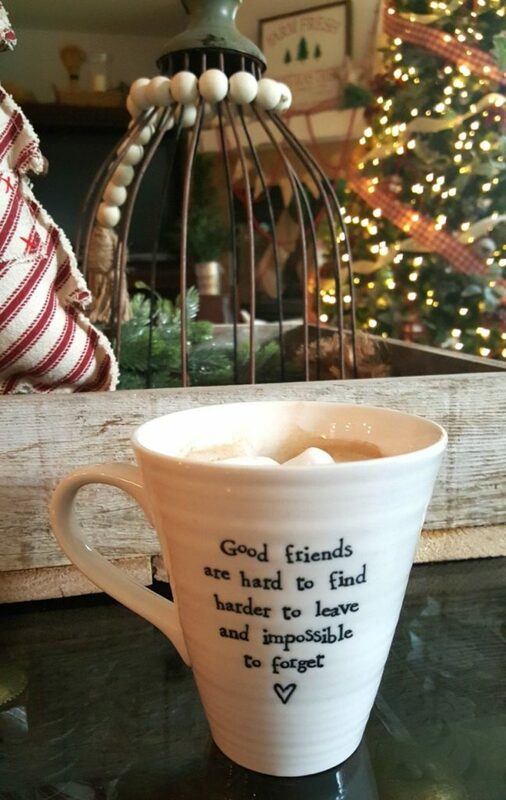 Shop these candles from Pottery Barn. It was a fall wreath that was still hanging on my fireplace. I didn’t think I would be keeping it up for Christmas. And then I saw how beautiful it would look to incorporate the creams and the same greens I had been loving for fall!! In a flurry of excitement I started pulling greens from the fall decor vignettes which were scattered around the house. I began sticking them in the tree. (Yes sometimes decorating can be crazy, fun, spontaneous and totally random!!) I also found wheat pieces and stuck those in there too. (Why not??) I started filling the tree will all kinds of different textures and colors of greens. My Christmas decor was off and running!! I wanted to incorporate some vintage treasures I had recently found. Specifically, I wanted to highlight an antique silver punch bowl, some silver trays, a vintage plaid blanket, some pewter dishes and an antique step ladder. These elements, coupled with my colors, helped me imagine the overall picture. I know!!! Even my shirt matches my decor theme! I told you I love plaid!! Can we talk for a minute about my tree? And I don’t mean the decor, just the tree! I got my tree this year from King of Christmas and I couldn’t be happier. We’ve always had a real tree and this is a first for us. I honestly love it so much I don’t know if we’ll ever go back! What I love? How easy and quick it was to put up. I single-handedly put up the whole tree in less than 15 min. And, it came pre-lit so I was ready to start decorating in no time. I also love how realistic it looks. Even up close the branches look so real. Did I mention I’m in love? Using different elements like metal, wood, cloth and glass all add to the interest of the decor! 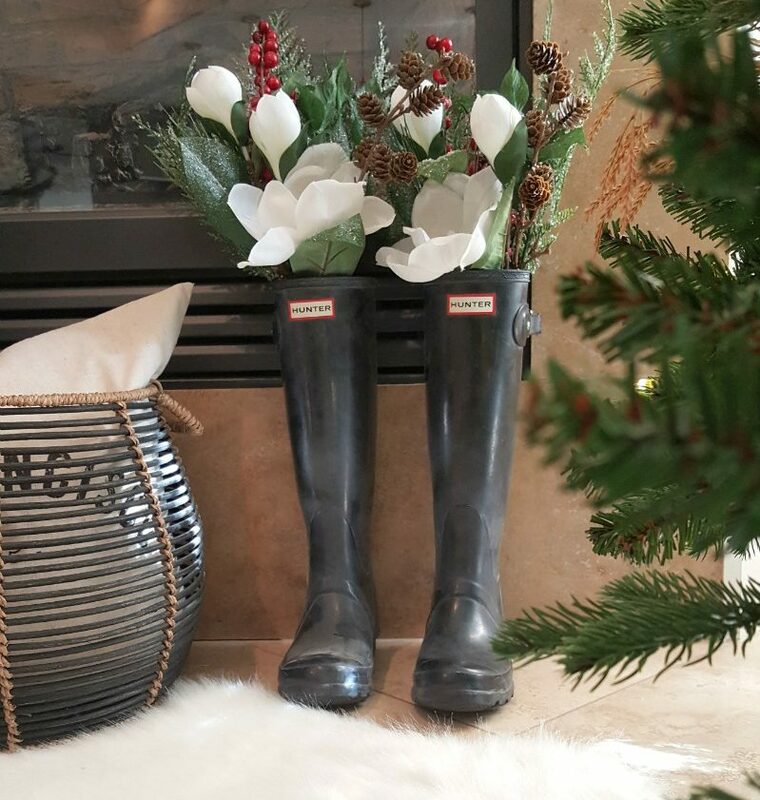 Hunter boots…those add rustic charm, right? A basket and natural linen pillow add detail and texture, as does my faux fur throw! 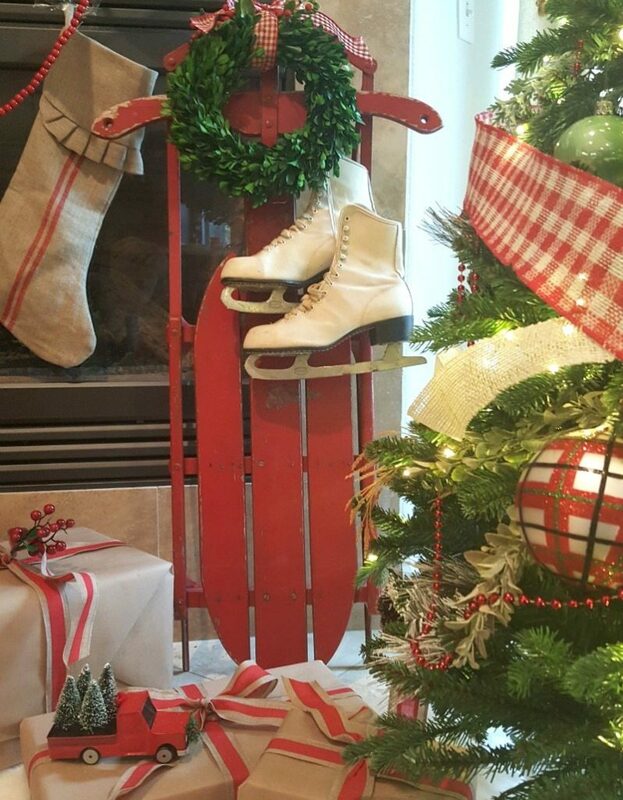 Antique red chippy sled and vintage ice skates are fun and festive. Here is a pic of when Thanksgiving dinner interrupted my holiday decorating….so we decided to just go with it! We decorated ALL FOUR tables in festive red and green! Everyone loved it! Who knows, it might be a new tradition! 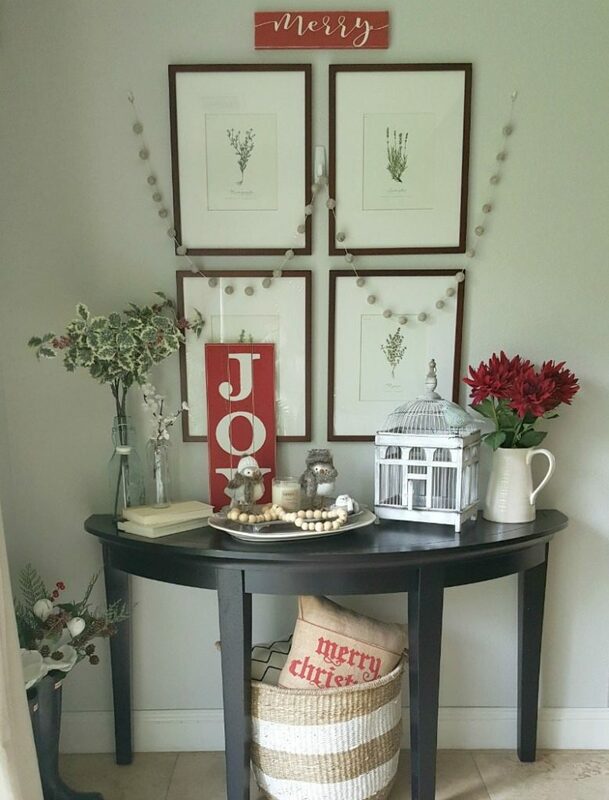 When this adorable Christmas sign arrived I decided to redo my mantel in its honor! It goes perfectly with my traditional cozy farmhouse decor, don’t ya think? 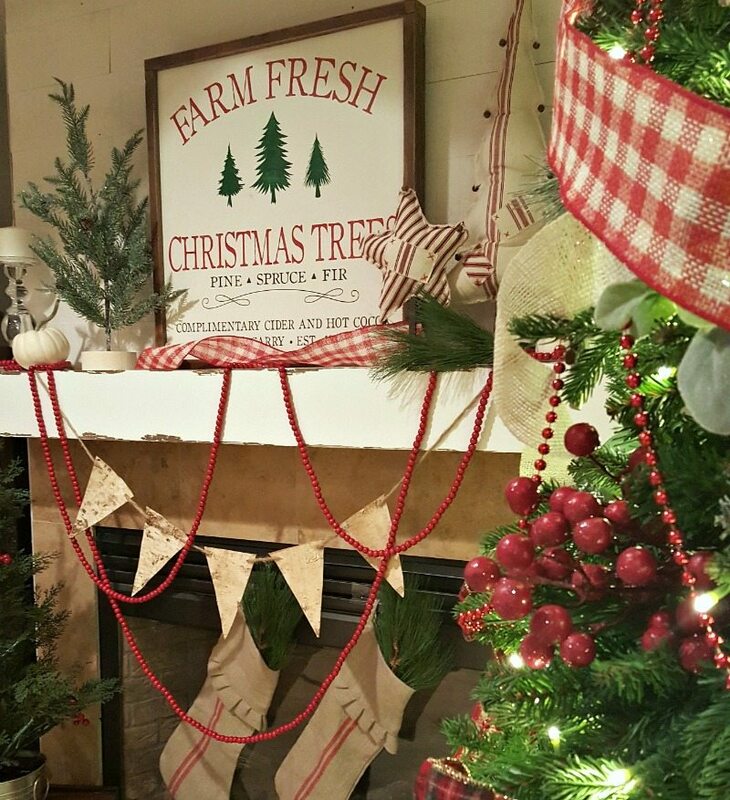 A mix of classic decor and rustic elegance give the perfect farmhouse look! The dining room decor theme was inspired by an antique silver punch bowl and three antique silver trays that I found at yes, an antique vintage market…go figure! I wanted the decor to feature these new special treasures…and everything fell into place after that. The trays provided the perfect balance for my tobacco baskets. Done! Check out my blog post about How to Create a Plate Wall or in this case, trays, using simple items you have in your home. I wanted my dining room to flow with the rest of my Christmas theme but I also prefer to keep it a little more formal and elegant. Therefore, I kept the decor to a minimum and chose not to incorporate any plaid. Finding a balance between rustic and elegant: sliver platters next to old chippy farmhouse windows. 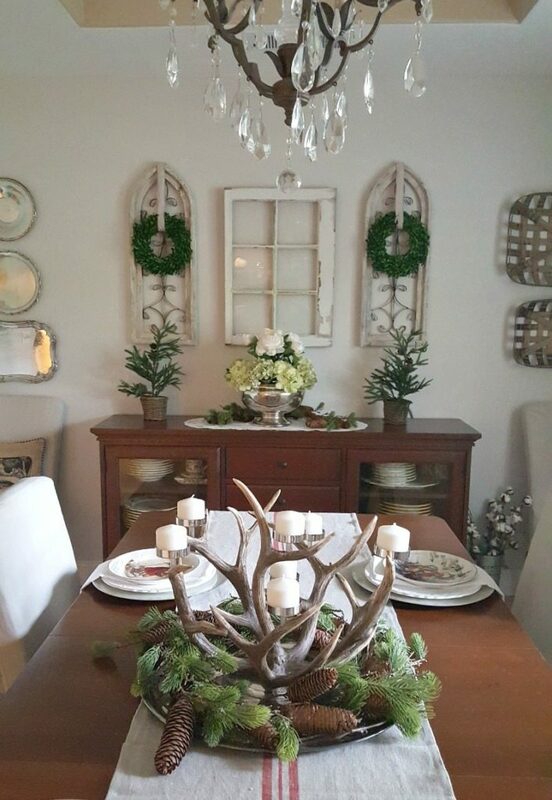 The chandelier adds elegance but the antler candelabra says rustic. Finally, this beautiful farmhouse linen runner balances these contrasting styles effortlessly. I kept things very simple adding faux evergreens around the antlers and the punch bowl. Next, I filled the punch bowl with faux flowers I found around the house. And lastly, two little table-top pine trees add symmetry to the buffet! Voila!. A rustic antler candelabra centerpiece, paired with a farmhouse linen striped runner is the perfect balance to the elegance of the chandelier and antique silver pieces. 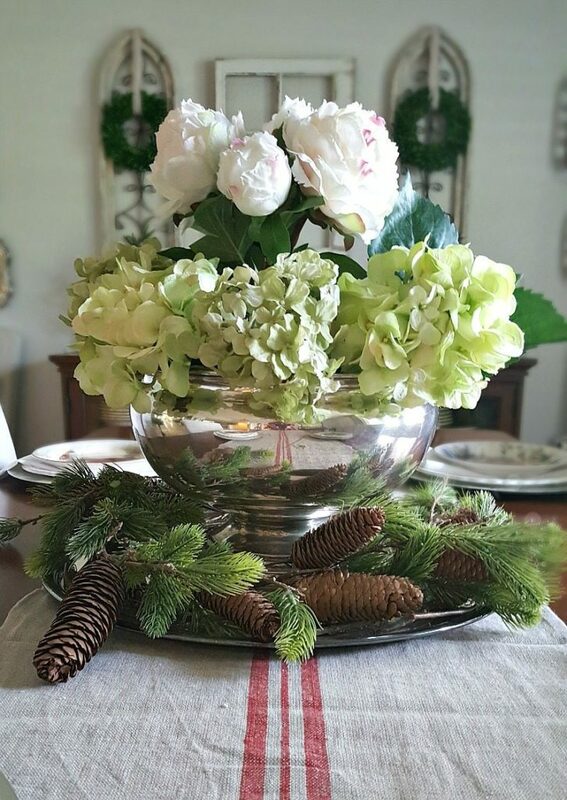 A mix of florals and evergreens add color and texture to my antique silver punch bowl. And a linen striped runner adds more farmhouse details. 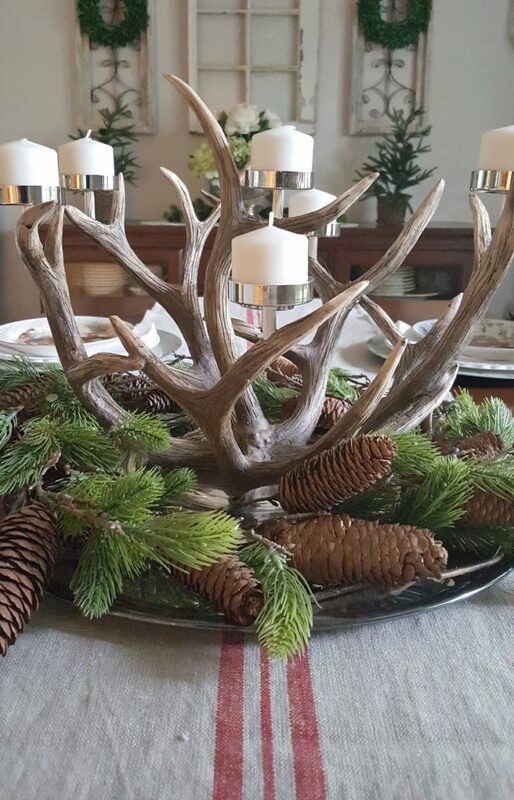 Antler candelabra and farmhouse runner both from Pottery Barn. 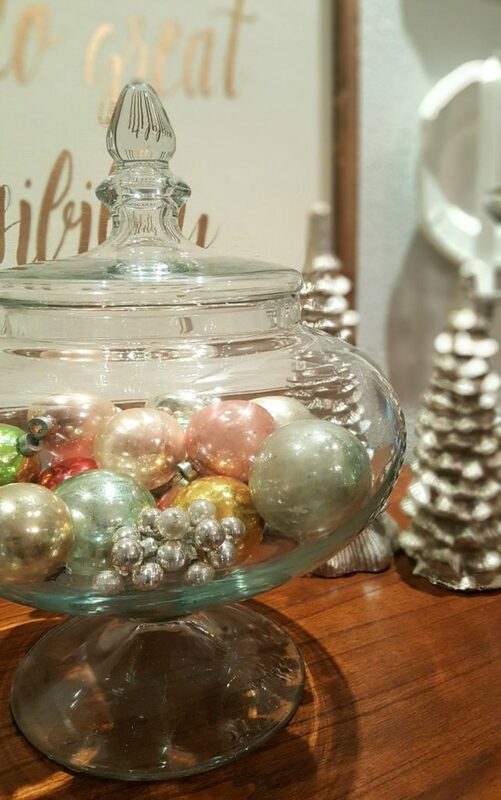 Antique Christmas ornaments add just the right amount of elegance and class to the vintage decor of the dining room. Everything gets a bit festive, even the chandelier! 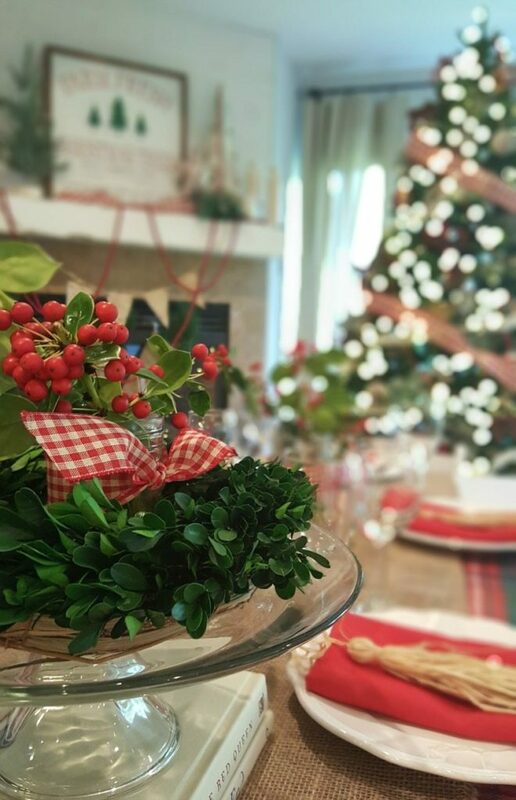 Gingham bows, fresh greens and plaid create a festive mix. This kitchen area is connected to the Great Room so it’s all about family, kids and casual living! 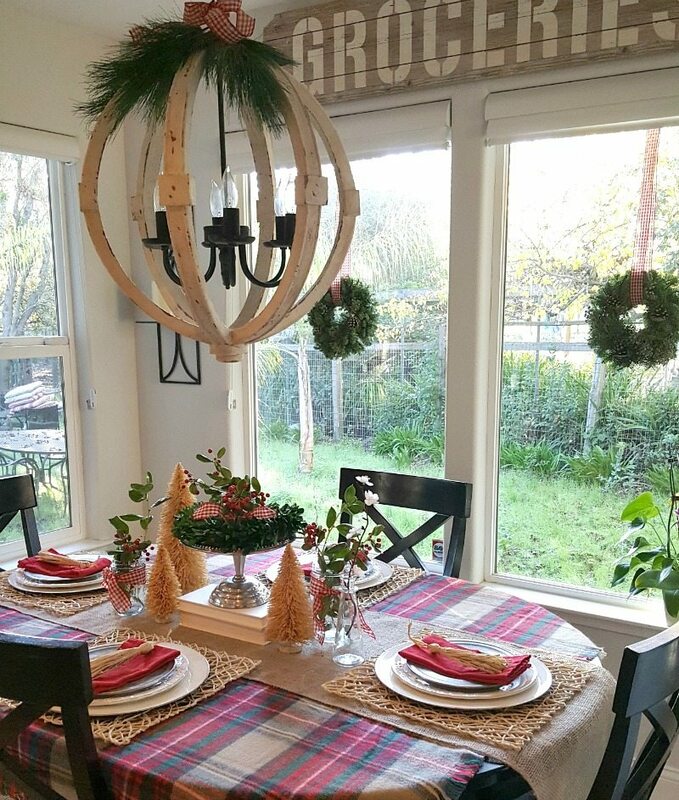 Decorating the kitchen table fell into place using a plaid scarf I found at Target. I reused some favorite neutral placements that are all about adding texture. I employed vintage pewter plates recently acquired at an Antique Market as well as my Grandmother’s silver (my grandmother would be so happy!) 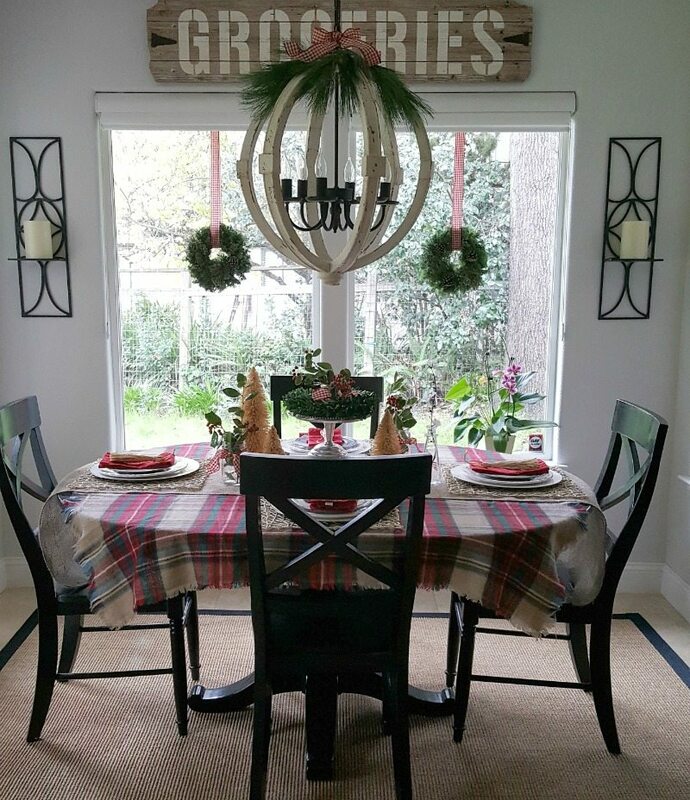 A couple of small wreaths and greens tied to the chandelier with gingham ribbon add the final touches. Neutral accents balance the bright pattern and colors of the plaid and gingham details. 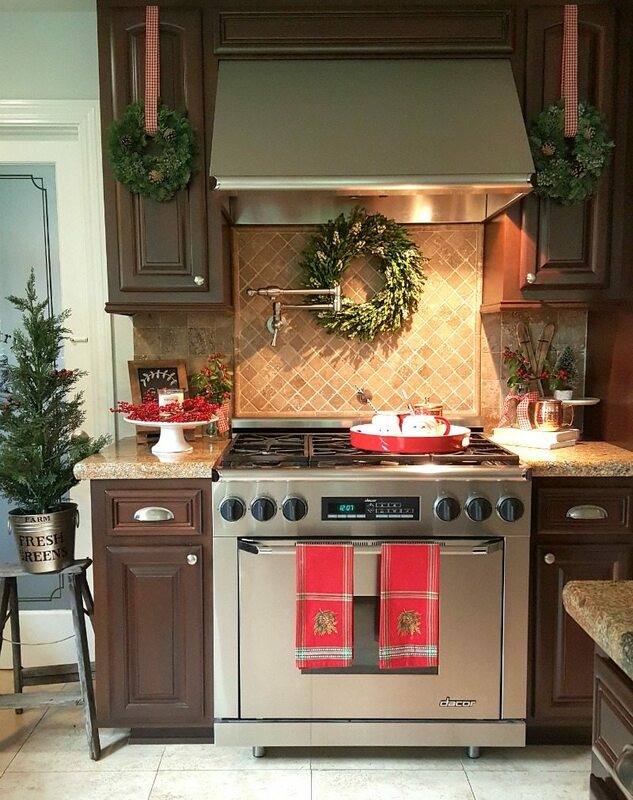 Why not bring Christmas into the kitchen!? The rich dark tones of the wood cabinets are warmed up with fresh greens and pops of red. Light and bright is the theme in this room year round! 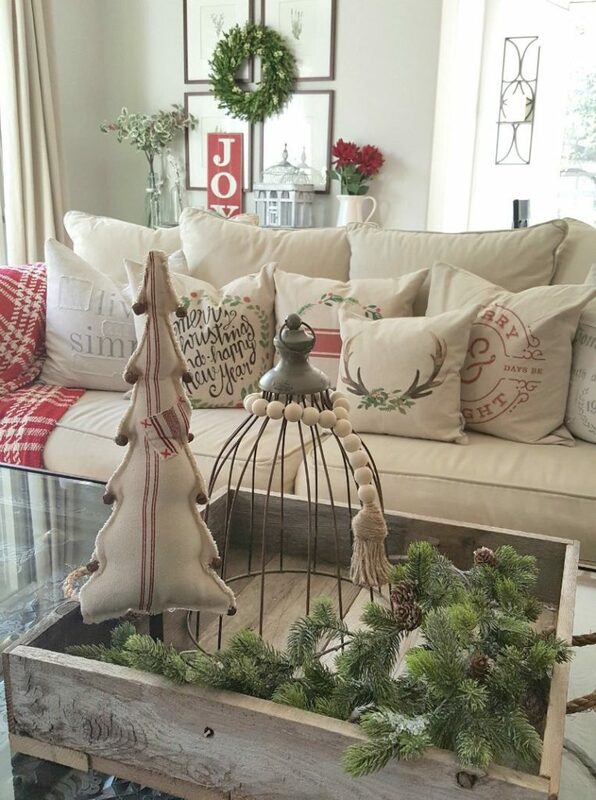 Keeping this room cozy and casual is easy with neutral colors and rustic pieces like this reclaimed barn wood box. Faux botanicals and a boxwood wreath warm up this light-filled space. One of my favorite spots to decorate (year round) gets a little update changing out the wreath to put up a new little “Merry” sign and a felt ball garland. Simple and festive. I can’t decide which version I like better, that’s why I like change! I like them BOTH! Even the 3-tiered tray gets a mini makeover for the season. All I did was swap out some of my white flowers for red berries. When you start with a neutral palette changing seasons can be easy! 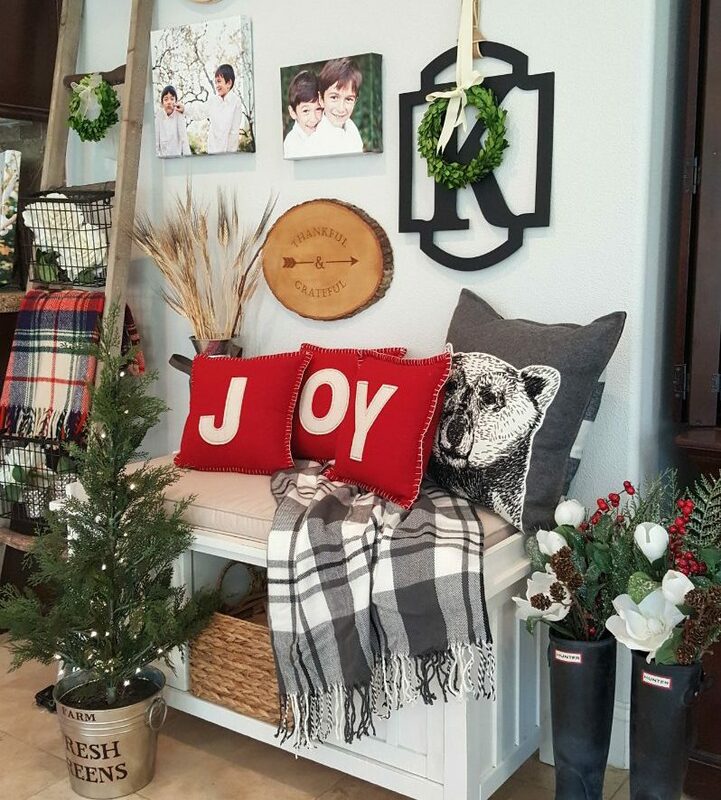 My gallery wall is always changing….festive pillows and plaid add the perfect touch. I love mixing family photos with personalized wood rounds and seasonal details. 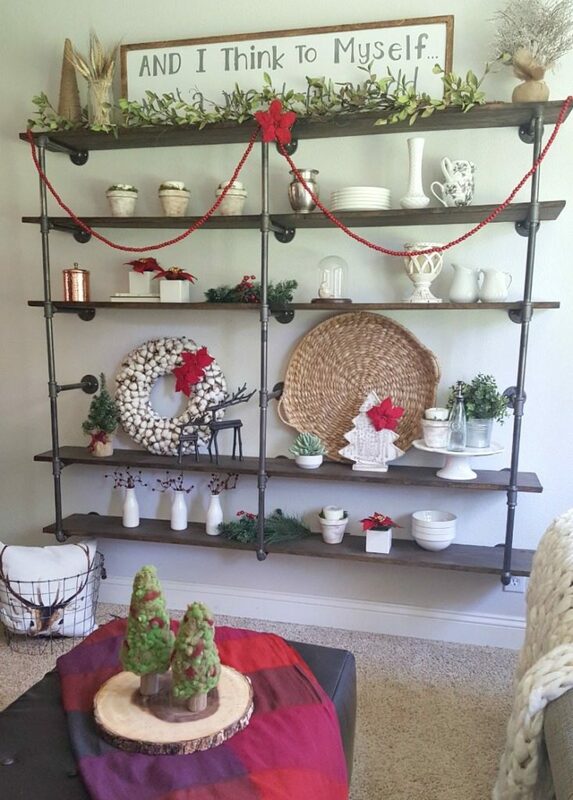 The rustic wood ladder is fun to decorate. I added a vintage plaid throw because, well, my obsession with plaid is real! Shop Target for these fun JOY pillows. My Industrial pipe shelves are a fun mix of rustic and urban styles. Read our DIY Industrial Pipe blog post to see how you can build your own shelves with simple pipes and wood from your local hardware store. Then have fun every season changing up the decor like I do! Rich woods contrast white bedding and create a warm and cozy room. 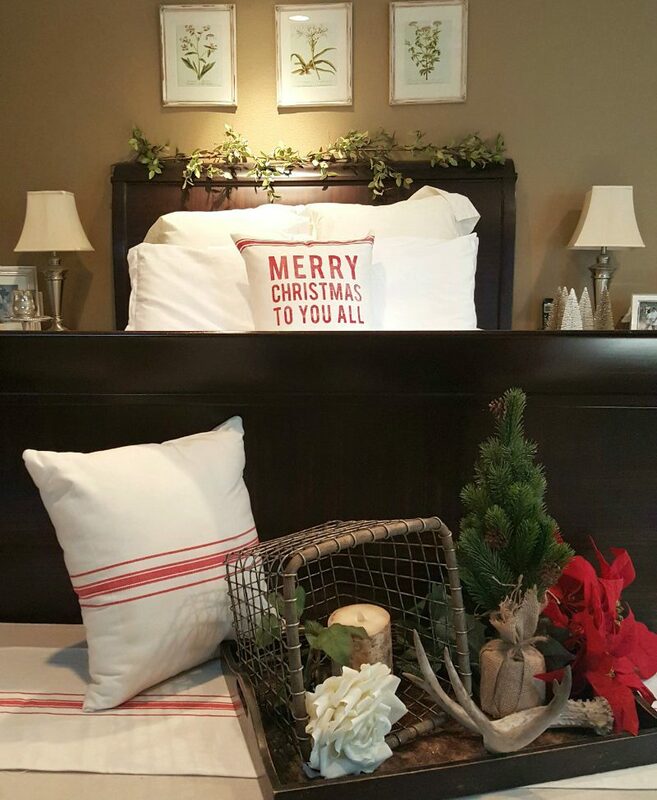 Christmas decor in the bedroom is so special because it feels very personal. No one is likely to see it, it’s just for your own enjoyment. You don’t have to do anything in your bedroom so simple touches make a big impact! All I did was add this garland of greens over my headboard and immediately the whole room felt updated and festive. 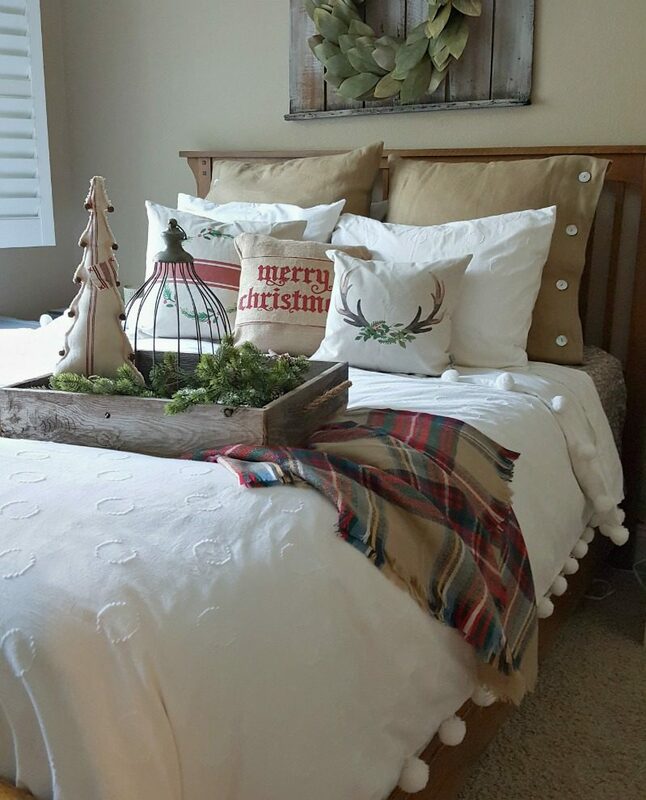 Adding a few Christmas farmhouse pillows was easy. Then I pulled in a few seasonal items to add detail on a tray. 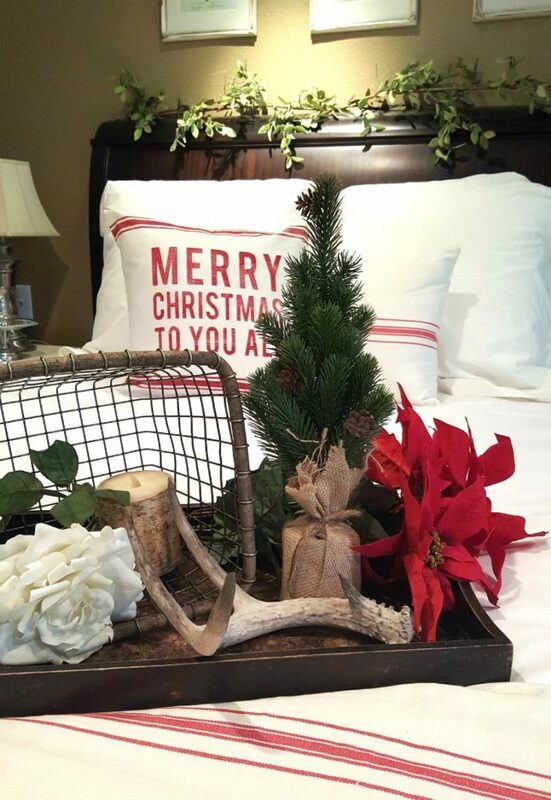 I kept to my traditional rustic theme by adding natural elements such as the birch candle, antlers and wire basket. 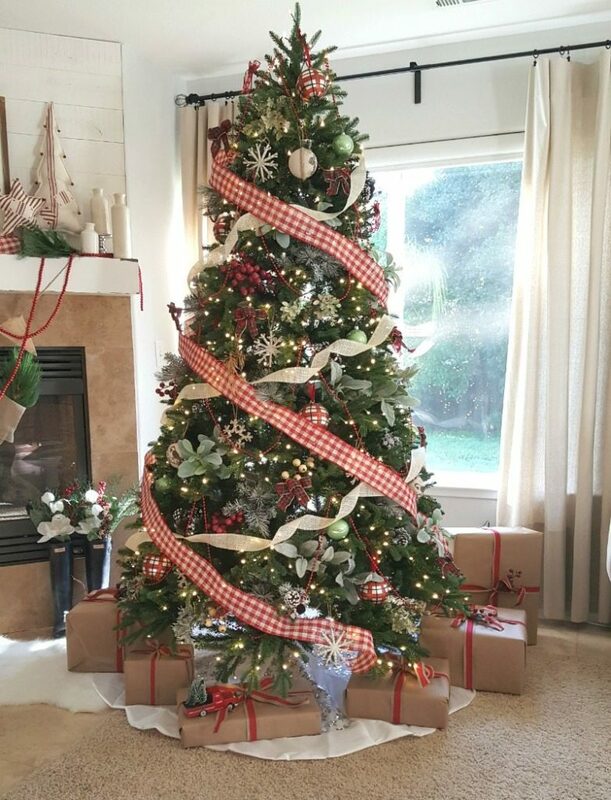 Even the little burlap wrapped tree fits the mood. The master bedroom came together when I added the garland. 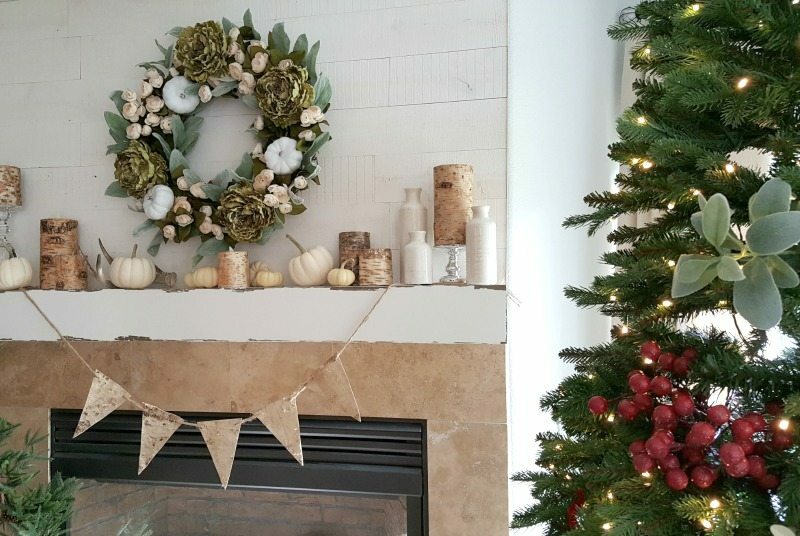 I chose a garland that didn’t scream Christmas but was more of a seasonally neutral variety so I can use it year round. It also helped the decor feel more natural. 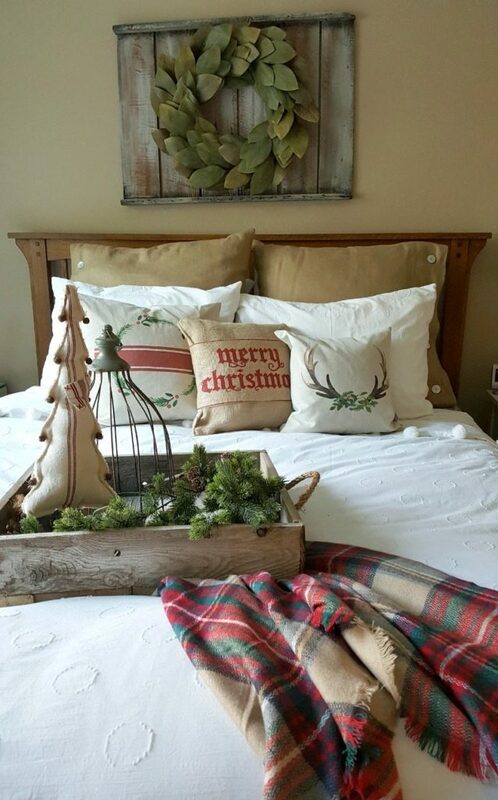 My guest bedroom is decorated with country farmhouse details, rustic woods, pillows and of course, plaid. I recently found the perfect frame for my magnolia wreath. From the moment I saw it I had a vision of exactly where it would go. Remember my Inspired Christmas Decor Theme? 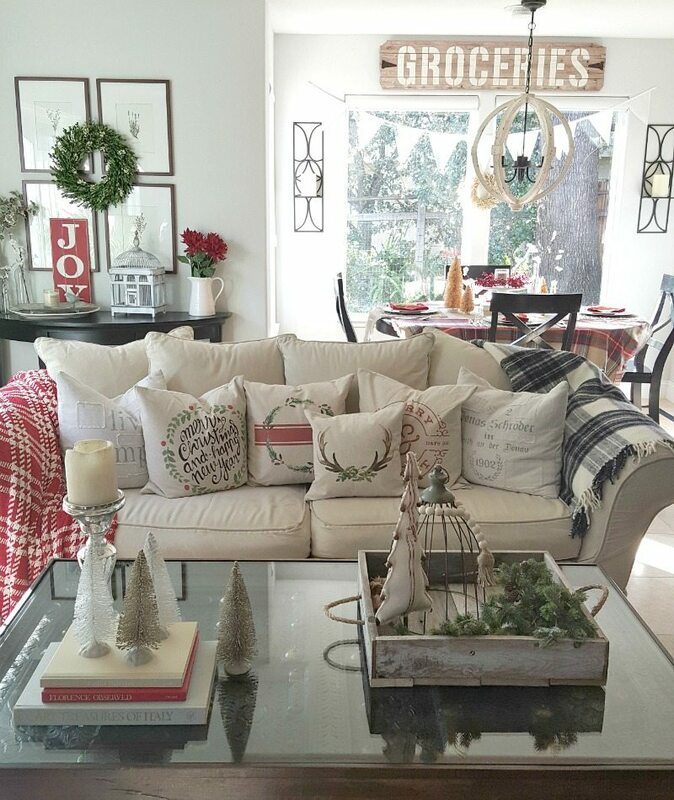 Plaid, rustic, natural/neutral colors of red and soft green, and vintage pieces….check, check and triple check! Cozy and casual is also the them in the guest bedroom! I hope it says “welcome” to everyone who visits. Phew!!! That was a LONG tour! I know. If you made it all the way through you deserve a medal! Seriously….thank you for stopping by. Even if you just scrolled through to check out a couple of rooms my wish for you is that you took at least one idea away with you! If you were inspired to incorporate even one new detail this year that makes me happy! And I hope it will make you happy too! Merry Christmas, Happy Holidays, and Blessings to you and your family for our home to yours!